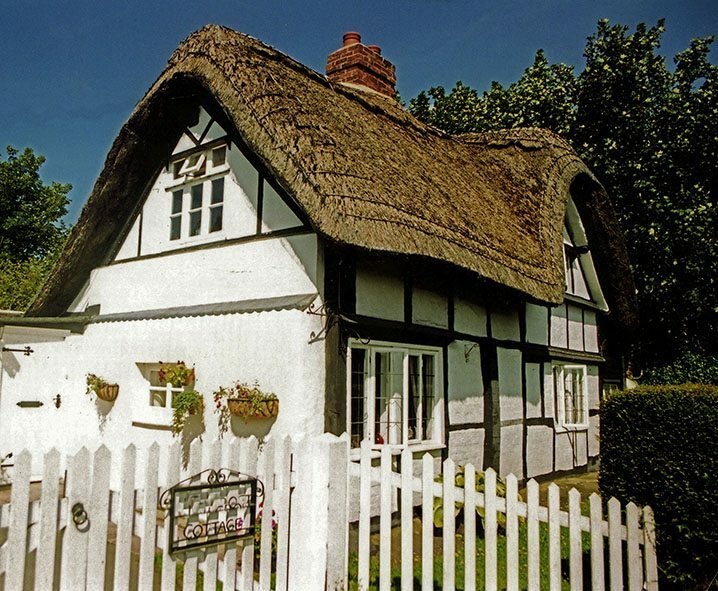 The craft in these two counties, generally follows the Southern thatching tradition. 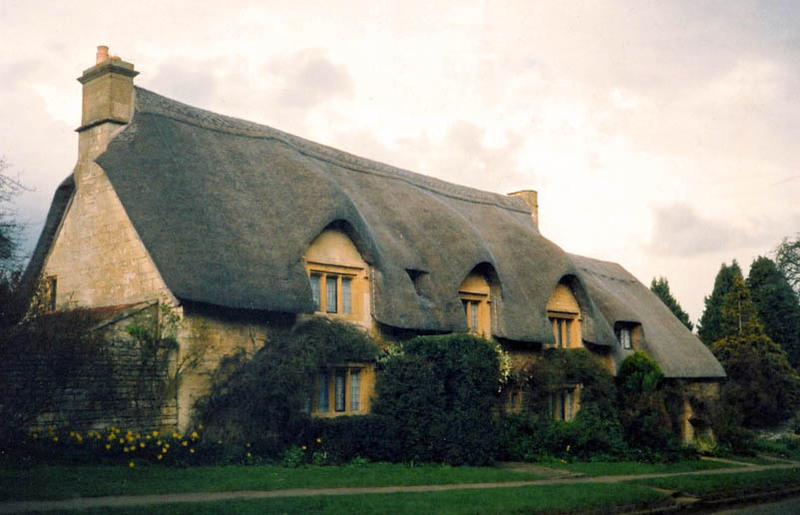 The roofs are not quite so rounded as in counties further south; but much thatching has a gentle curve. Over most of this area, long straw was the dominant material, this is now rarely seen. Reeds, of either combed wheat or water are mostly used. 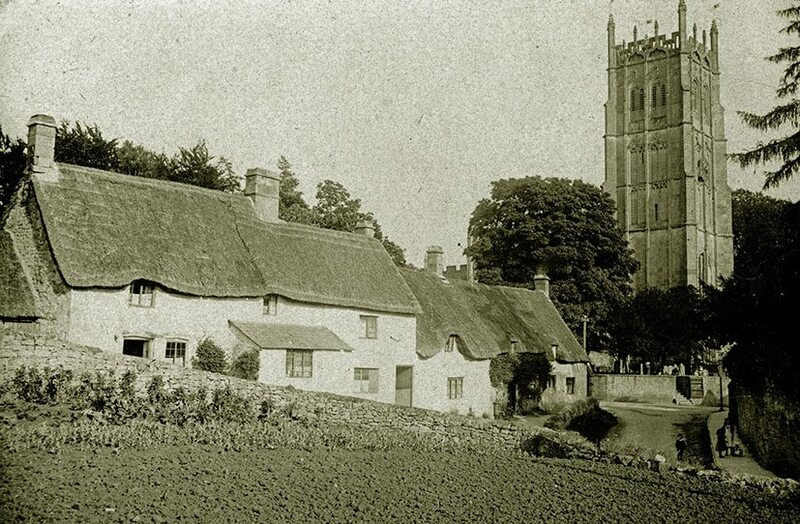 But in the south of Gloucestershire, combed wheat usage marks a return to a traditional material. 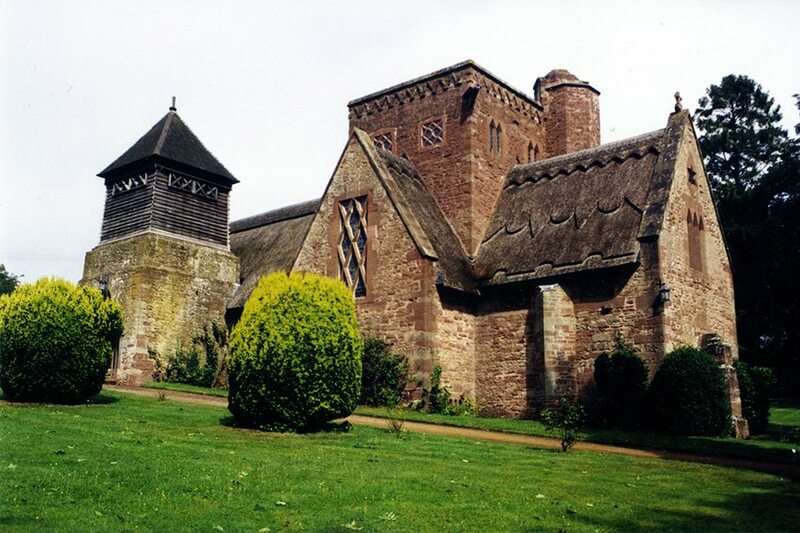 Arts & Crafts… An early example of this genre, is All Saints at Brockhampton by Ross, in Herefordshire, built in 1902. 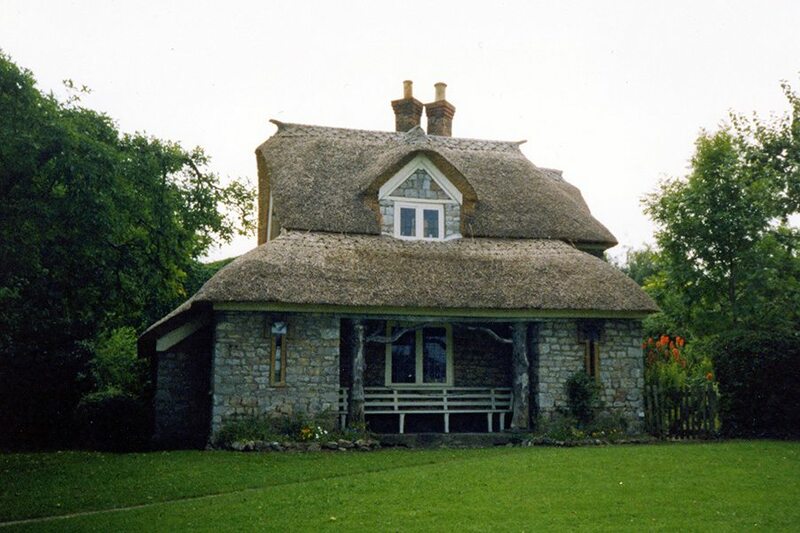 The modern thatching, has replicated the pattern of the original water reed roof. Which follows no local style… The interior, is decorated with tapestries, designed by Burne Jones. Combed wheat reed thatching was noted by Thomas Rudge, in his agricultural Report of 1807. 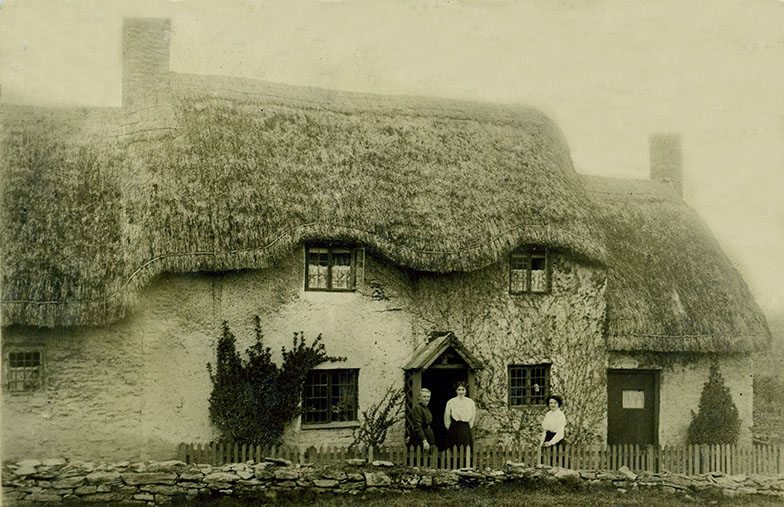 ‘The best and most durable thatch’ was to be found around Berkeley and the ‘Lower Vale’. He noted that straw was cleaned by iron combs; after having the ears cut off; locally called ‘Helm‘. 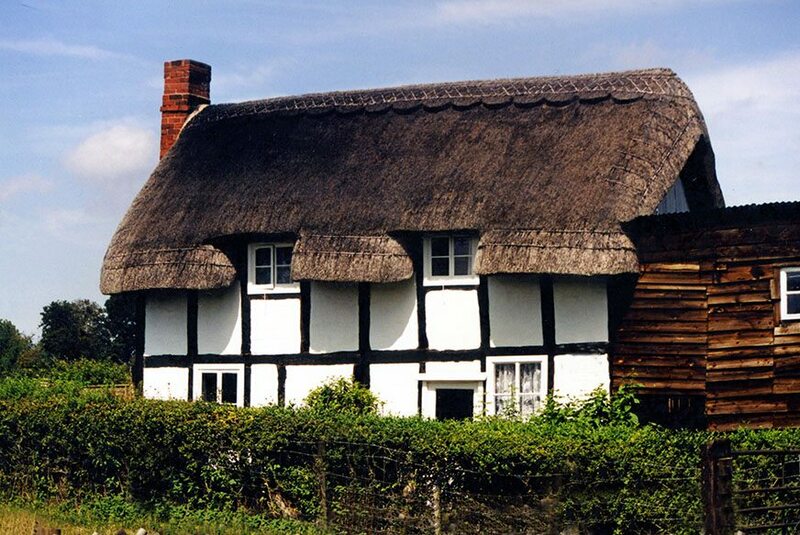 Mr Rudge thought this a ‘remarkably neat thatch’ that lasted thirty years. Coating with this combed helm straw cost five shillings a square, including ‘spicks and rope yarn’. 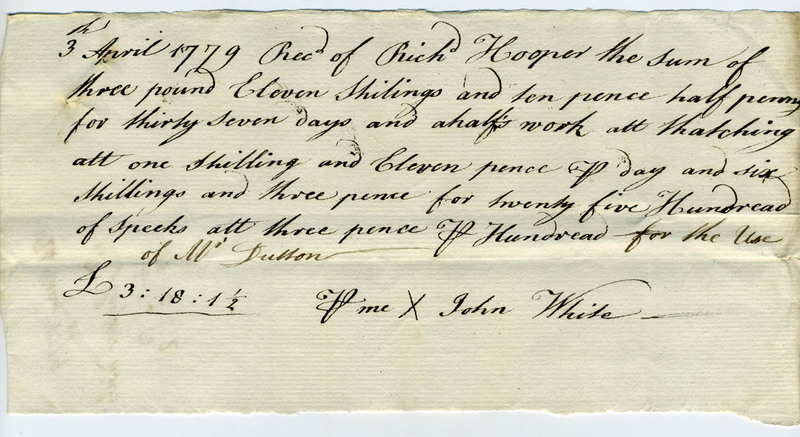 Spicks, a Gloucestershire term for spars, were four pence halfpenny a hundred. 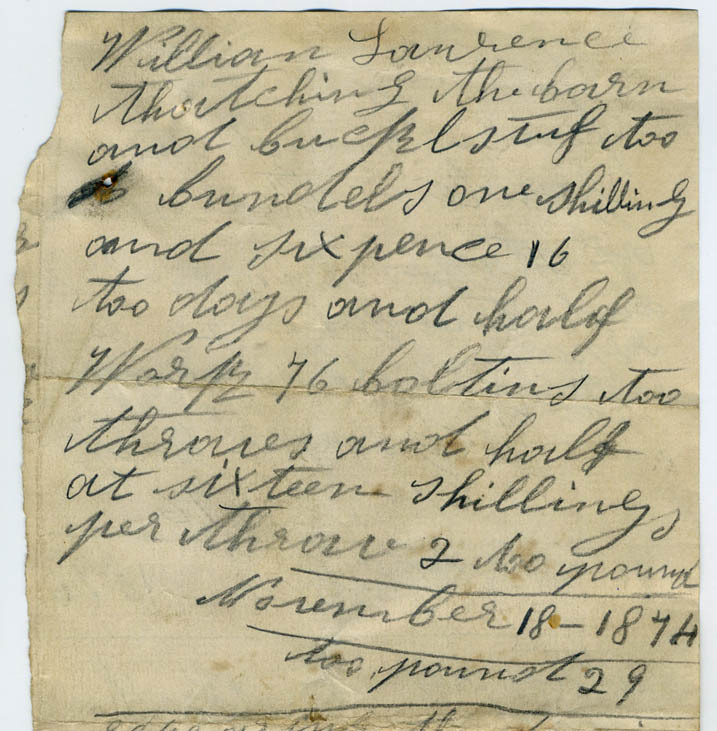 Rope yarn, for tying on new work, was tenpence a pound, this was twine soaked in Stockholm tar… In Herefordshire a local name for a spar is a Buckle. 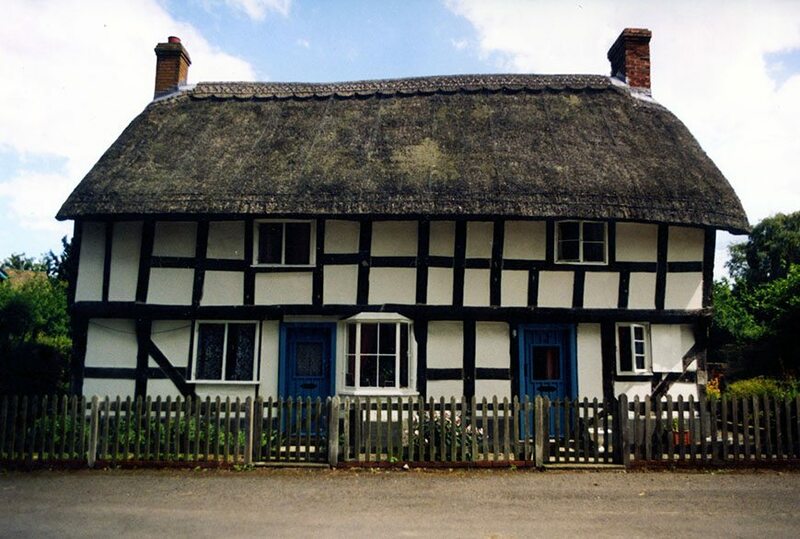 Herefordshire rarity… A long straw thatch at Bartestree. Not a common sight, with most other roofs now of combed wheat and water reed. 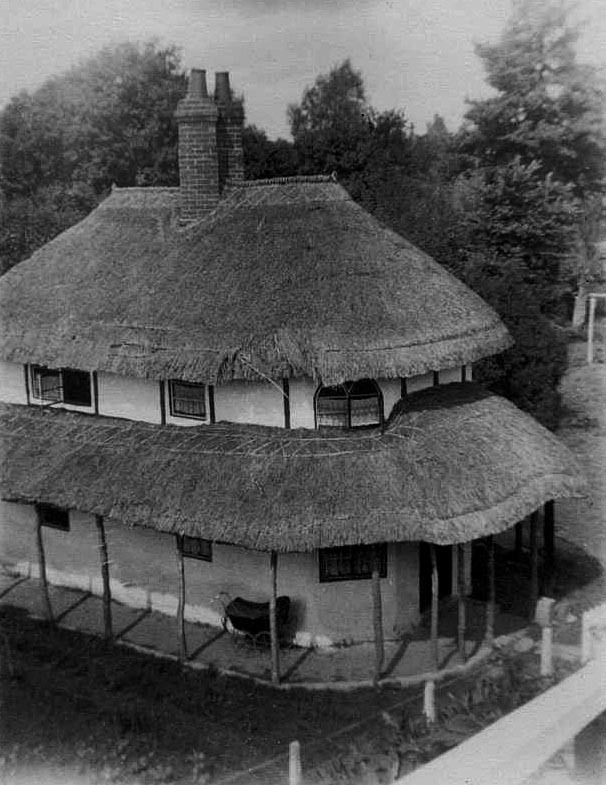 This cottage also shows the local curved style well. 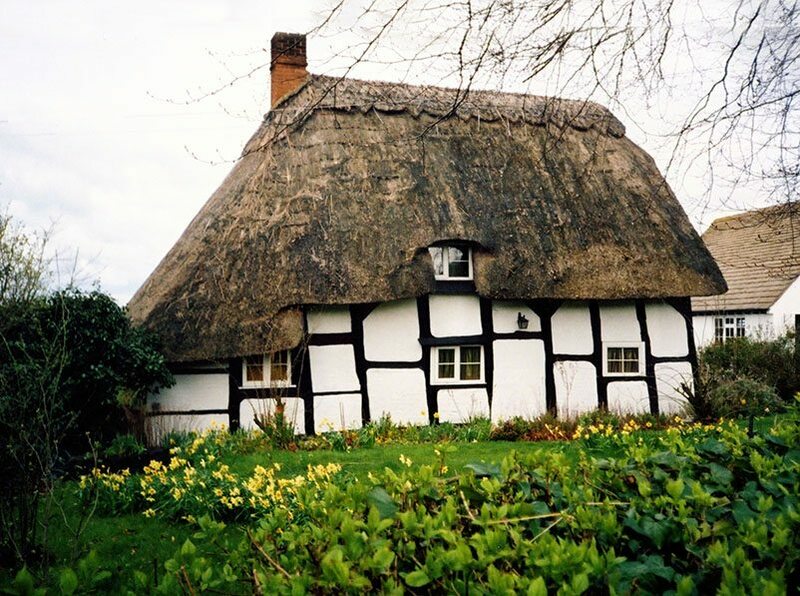 Herefordshire cruck construction… This cottage, at Much Marcle, consists of a single ‘bay’, erected in the sixteenth century. 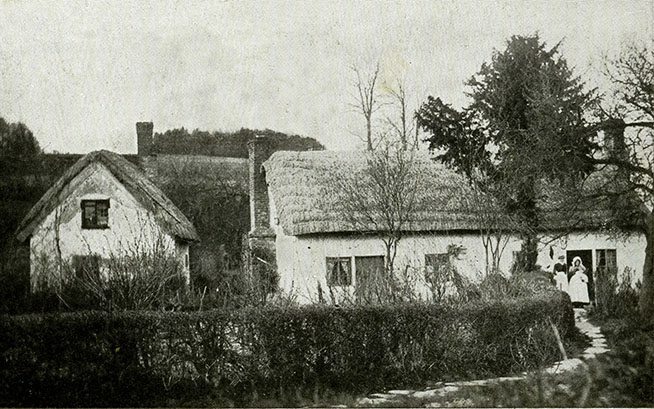 The old Edwardian image, shows the roof covered with a coat of directional repairwork… Below, is a combed wheat reed thatch at Leintwardine; a place with some very attractive roofs. 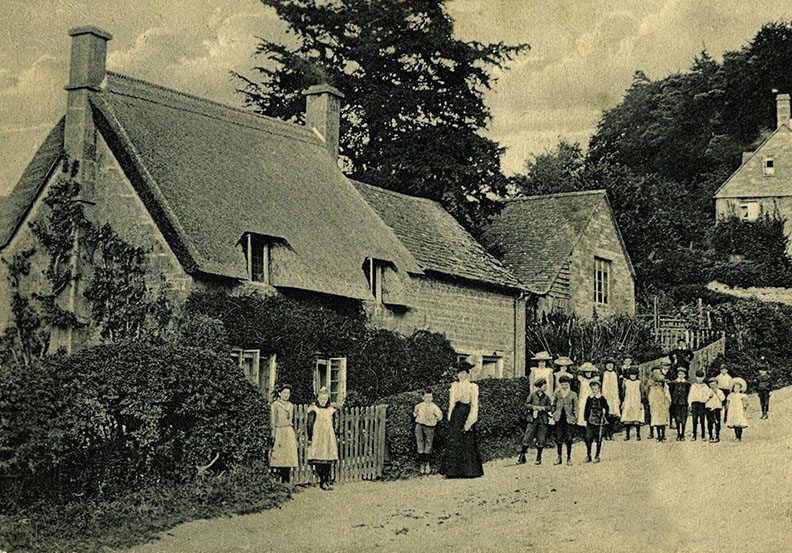 The above Edwardian image shows thatching at Bodenham. 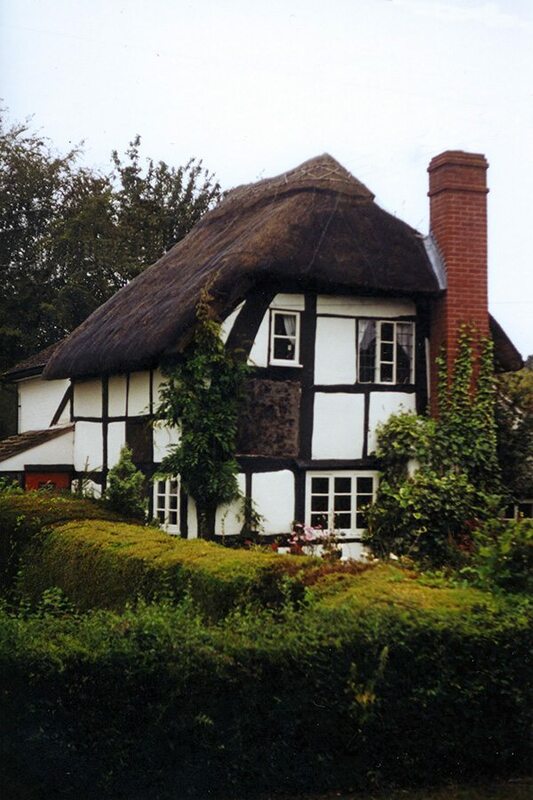 Written records also survive, of thatching hereabouts… Three decades earlier a Mr Williams, of Brockington, employed two thatchers. In 1873 John Merrick had completed 10 squares of coatwork, at four shillings a square. 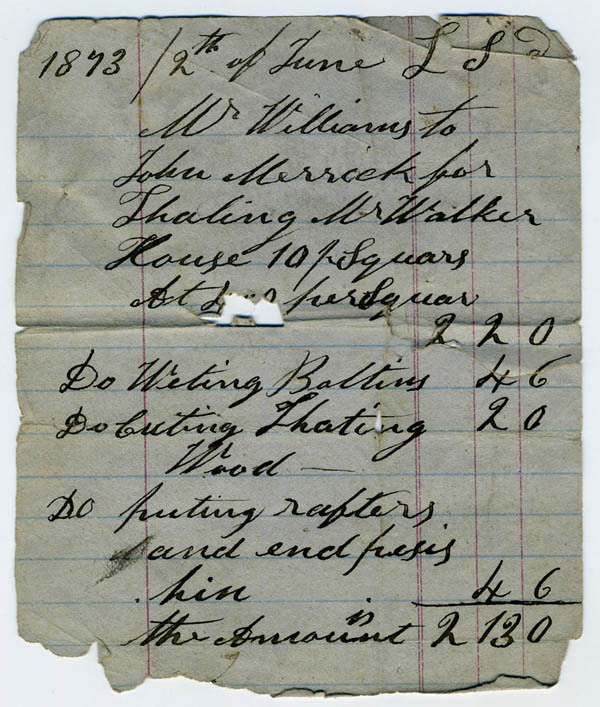 The item on his bill, for ‘Wetting Baltines’, could refer to yealming long straw. 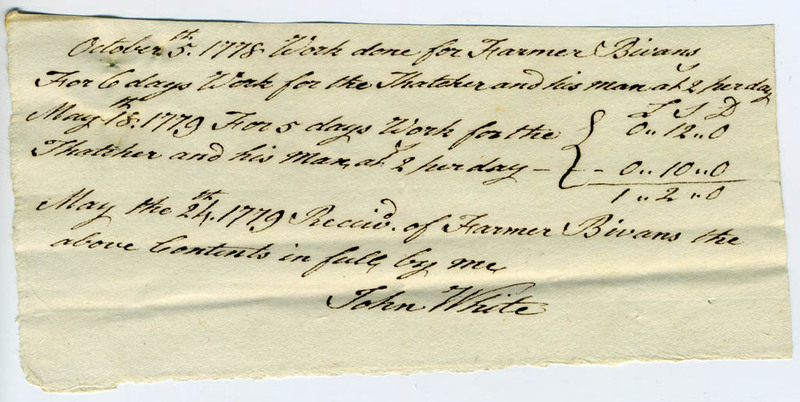 A year later a rough account was kept, of work by William Laurence. He does not seem to have been paid ‘ by the square’, but for each ‘thrave’ of material used. Being paid sixteen shillings a thrave. (Which was seeminly a much larger amount of material, than a normal thrave of 24 sheaves.) The bundles of ‘stuff’ mentioned were very likely thatching spars..
A roof of combed wheat reed at Sutton Lakes, cleverly crafted to follow to the local Herefordshire style. A modern combed wheat roof, at Brampton Bryan. One of several thatches in the area. 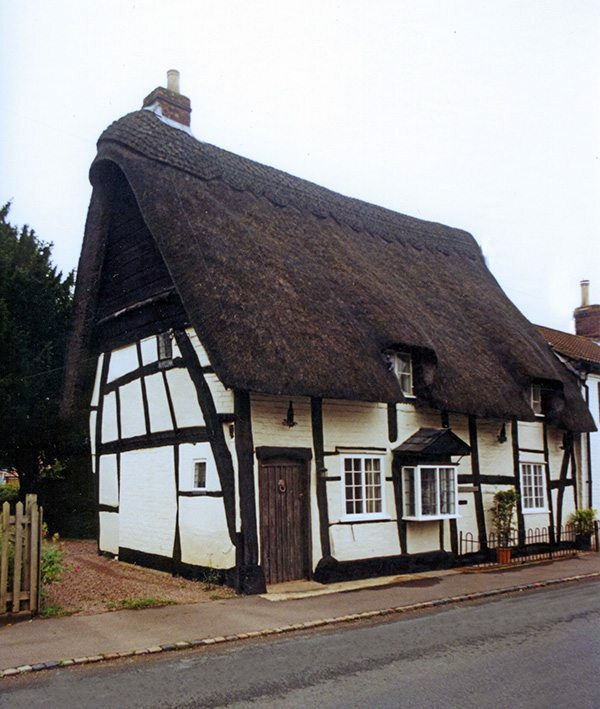 Leaning thatch… As this ‘two bay’ cruck cottage, at Dymock, dates from the 1400’s, I guess its allowed to lean a little… Away from the Cotswolds, most extant thatching in this county, covers timber framed buildings. Creating some very attractive dwellings. 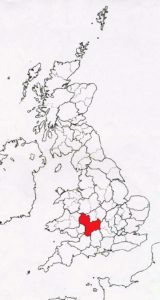 Such as those at Haresfield on the lower left and Brookthorpe, on the lower right… All being coated in combed wheat reed. 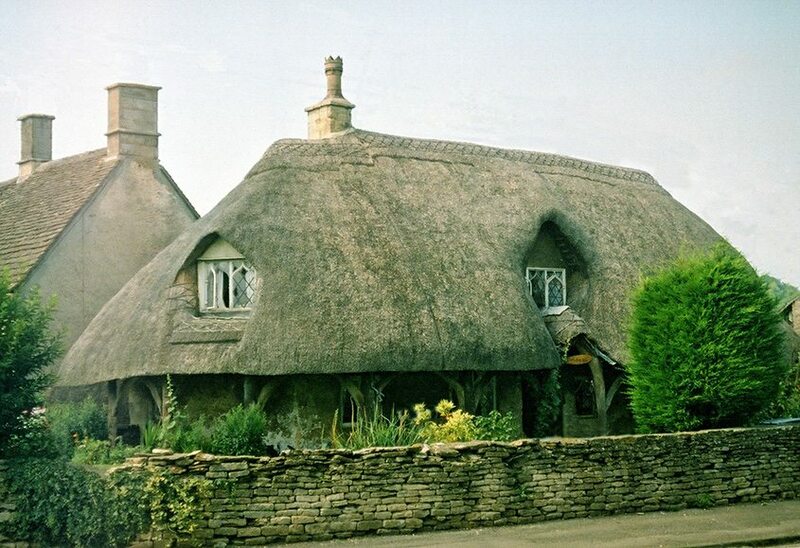 Cotswold thatch… At Chipping Camden. Showing a very rounded combed wheat reed thatch. 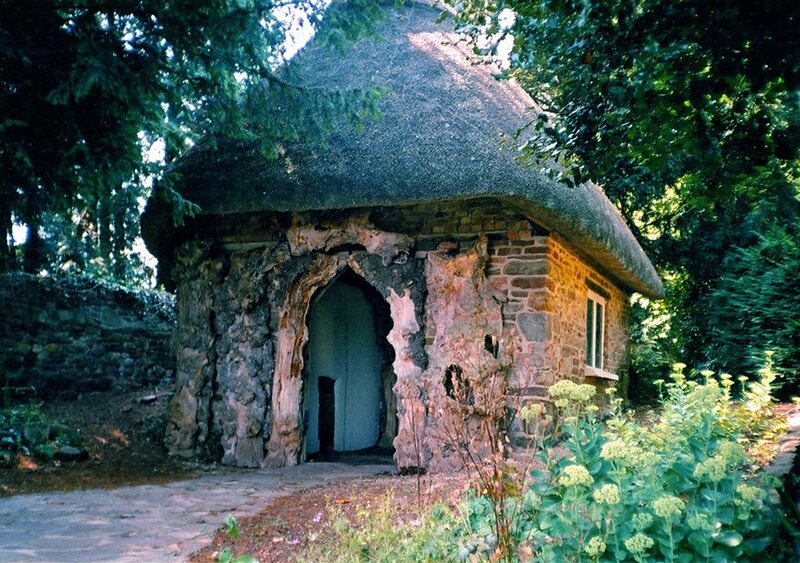 Finally… The Temple of Vaccinia; Britain’s Most Illustrious Summerhouse. 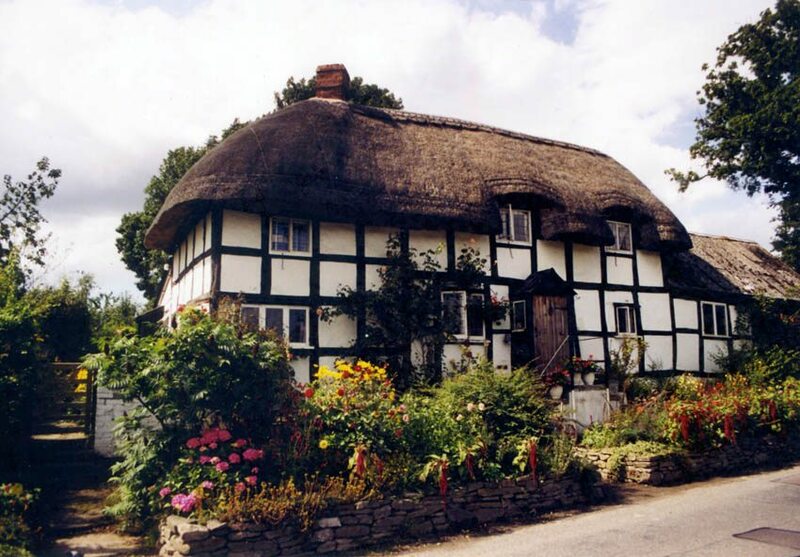 In the pleasant little town of Berkeley, in Gloucestershire; lies an elegant house with a large garden. 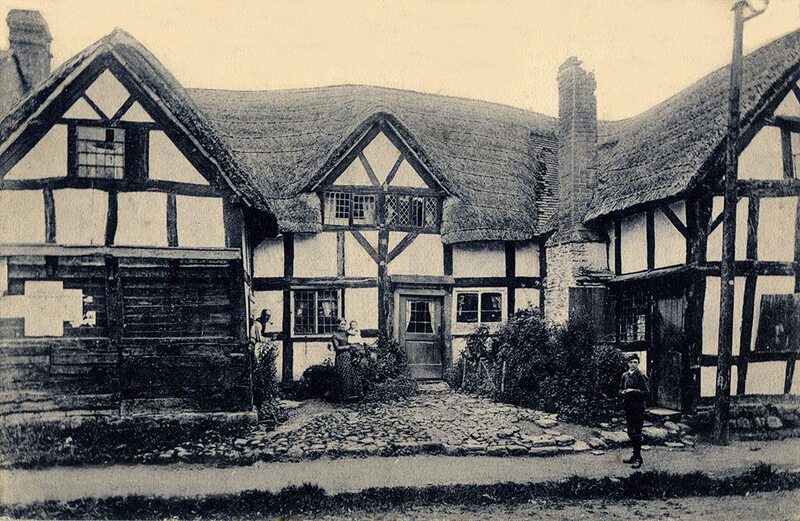 This pleasant property, was once the home of a quite remarkable man; Edward Jenner (1749-1823). A country doctor for fifty years; who had the wit and the wisdom, to develop a safe and effective cure for smallpox. And thus help found, the science of preventative medicine. A man of many parts; he studied natural history, collected fossils, from an early age and in the year following the first ever ascent, he built and flew his own balloon… ( He met his future wife, when his balloon landed on her father’s estate.) 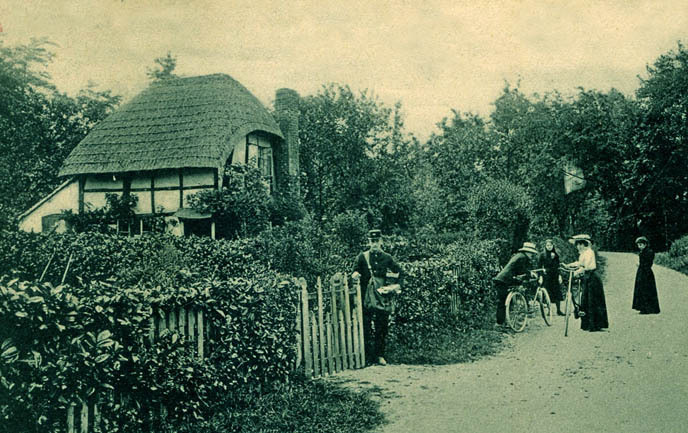 A follower of fashion, he also had a ‘Picturesque’ thatched summerhouse built, at the end of his garden. On his rounds, Doctor Jenner came to know of a popular belief; that milkmaids, who caught the cattle disease cowpox, recovered and did not fall prey to the feared killer smallpox. 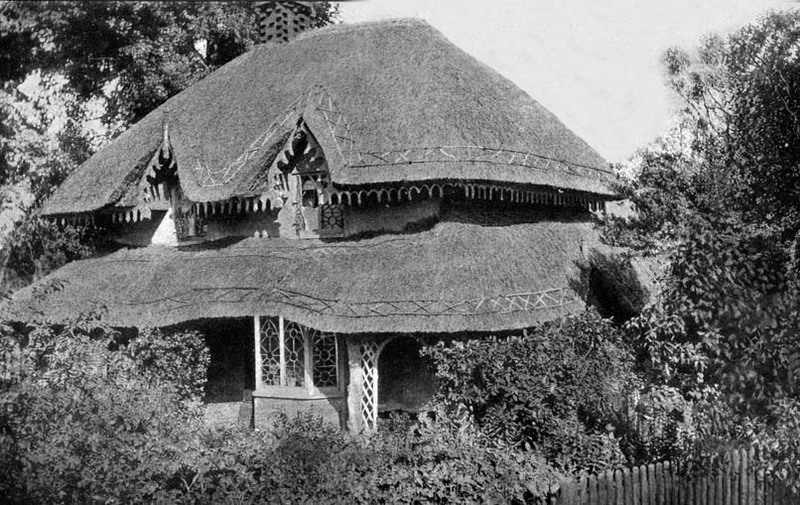 Doctor Jenner felt confident enough to test this theory; using his thatched summerhouse, as a laboratory. Jenner’s summerhouse today…. With a coat of combed wheat reed. 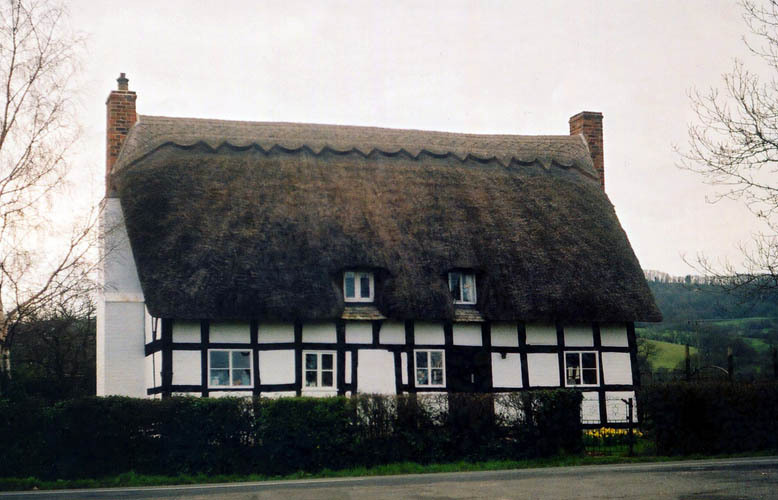 Earlier photographs show a roof in long straw. 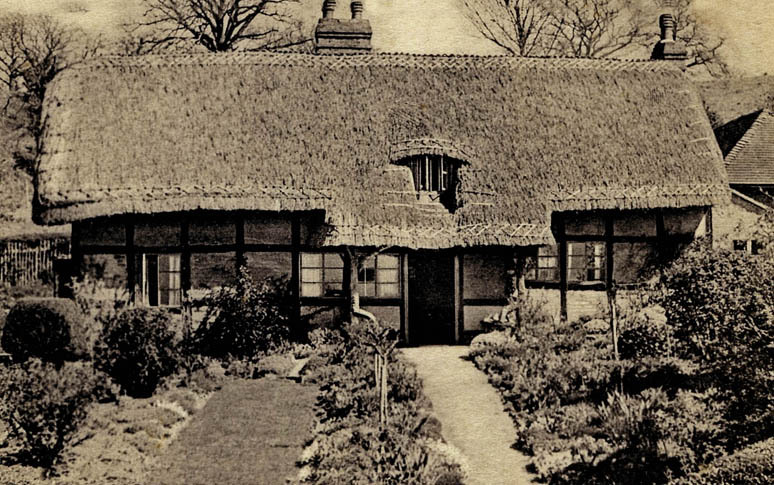 In the past, the roof became rather dilapidated, with unfortunate results, for the ornate ceiling underneath… The overhanging trees make a poor site for thatch; but reflect the garden, as Jenner knew it. The Turkish practice, of using a mild form of smallpox to inoculate a person; had been known of, in Britain, for a couple of generations. But this ‘cure’ often killed the patient. And, it seems the cowpox theory was known in various countries but the local medics, never made widespread use of it. Unlike Doctor Jenner. By 1802, a hundred thousand shots of the doctor’s vaccine, had been used all over Britain. A grateful parliament gave Edward Jenner the huge sum, of ten thousand pounds, to keep up the good work. A further twenty thousand pounds, following four years later.